Simon & Schuster, 9781476754796, 96pp. Too many people have come to dread the approach of the holidays, a season that should -- and can -- be the most relaxed, intimate, joyful, and spiritual time of the year. In this book, Bill McKibben offers some suggestions on how to rethink Christmastime, so that our current obsession with present-buying becomes less important than the dozens of other possible traditions and celebrations. Working through their local churches, McKibben and his colleagues found that people were hungry for a more joyful Christmas season. For many, trying to limit the amount of money they spent at Christmas to about a hundred dollars per family, was a real spur to their creativity -- and a real anchor against the relentless onslaught of commercials and catalogs that try to say Christmas is only Christmas if it comes from a store. Christmas is too wonderful a celebration to give up on, too precious a time simply to repeat the same empty gestures from year to year. 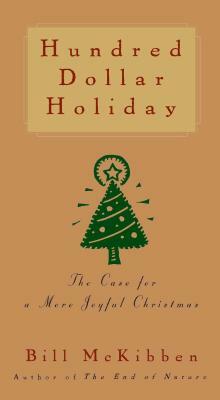 This book will serve as a road map to a Christmas far more joyful than the ones you've known in the past. Bill McKibben is the bestselling author of The End of Nature, The Age of Missing Information, and The Comforting Whirlwind: God, Job, and the Scale of Creation. A former staff writer for The New Yorker, he lives in the Adirondack Mountains of upstate New York.